The Paris Fire Brigade at the Bastille Day Military Parade. The Paris Fire Brigade (Army) and Marseille Naval Fire Battalion (Navy) are military units providing fire protection to Paris and Marseille. The rest of France has civilian fire services organized, supervised and trained by the French Ministry of the Interior; specifically, they fall under the Civil Defence and Security Directorate (Direction Générale de la Sécurité Civile et de la Gestion de Crise, DGSCGC). There are approximately 246,900 fire service personnel in France operating 15,642 emergency vehicles out of 6,894 emergency centres. In addition to providing fire protection and rescue, the French fire service is also one of the providers of emergency medical services. In French, firefighters are known as pompiers or sometimes as sapeurs-pompiers. The latter refers to the military-based Paris Fire Brigade, though it is sometimes informally used for firefighters elsewhere. Pompier (firefighter) comes from the word for "pump", referring to the manual pumps originally used for firefighting. Sapeur means "sapper" and refers to the first official firefighting unit created by Napoleon I which was part of the military engineering arm. 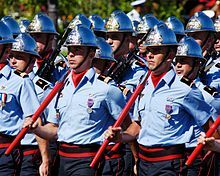 Firefighters in the Marseille Marine Fire Battalion are known as marins-pompiers (sailor-firefighters). The usual name of a civilian fire services is a service departmentaux d'incendie et de secours (SDIS) (Departmental Fire and Rescue Service). Paris and the three departments of the petite couronne (Hauts-de-Seine, Seine-Saint-Denis and Val-de-Marne) are covered by the Paris Fire Brigade. Bouches-du-Rhône is covered by both the Marseille Naval Fire Battalion and a civilian Bouches-du-Rhône SDIS. Lyon Metropolis and Rhône are both covered by the Rhône SDIS, reflecting Rhône's boundaries before 2015. Corsica is divided between two fire services, reflecting the departments that existed from 1975 to 2017. ^ Not integrated into the fire services. In addition, they employed 11,910 medical responders, and 10,900 administrative and support personnel. The jeunes sapeurs-pompiers (Junior fighters) and cadets numbered 27,800. Civilian professional fire fighters are local government civil servants of class A, B, and C. Civil servants class A and B, and their volunteer counterparts, are trained at the National Fire College, École nationale supérieure des officiers de sapeurs-pompiers. Given their military origin, rank insignia follow those of the French Army. Professional fire fighters class C are recruited from volunteer fire fighters or youth fire fighters, age 18 or above, with three years service as Sapper without a civil service exam. Corporals can be recruited with a civil service exam open to direct entry candidates who passed middle school, and through a civil service exam open to volunteer fire fighters or youth fire fighters, with three years service. In 2017, Sapeur de 1re classe was abolished and Sapeur de 2e classe was replaced by the rank of Sapeur, except for volonteers whose grades remained unchanged. Promotion to Corporal can occur after three years as Sapper; to Chief Corporal after five years as Corporal. Sergents are selected through a civil service exam open to team leaders. Promotion to Adjudant and Chief Adjudant can occur after four years as Sergeant/Chief Sergeant. Since 2013, Chief Adjutant is the highest NCO rank of most departments as the rank of Major has been abolished. Professional fire fighters class B are recruited through civil service exams open to direct entry candidates with a foundation degree in engineering, and to fire fighters class C with four years service, leading to employment as Lieutenant 1st class; and through a civil service exam open to fire fighters class C qualified as senior crew commanders, leading to employment as Lieutenant 2nd class. 75% of the promotions from Lieutenant 2nd class to Lieutenant 1st class are through a civil service exam open to Lieutenants 2nd class with three years in the grade; 25 % through selection from Lieutenants 2nd class with five years in the grade. 75 % of the promotions from Lieutenant 1st class to Lieutenant above class are through a civil service exam open to Lieutenants 1st class with three years in the grade; 25 % through selection from Lieutenants 1st class with five years in the grade. Direct entry lieutenants 1st class are undergoing a 32 weeks course at the French Fire College (Ecole Nationale Supérieure des Officiers de Sapeurs-Pompiers). Lieutenants 2nd class are undergoing a 12-week course at the Fire College, while Lieutenants 1st class promoted from 2nd class, are in addition undergoing a course of 6 weeks. Professional fire fighters class A are recruited through civil service exams open to direct entry candidates with a bachelor's degree in engineering, and to fire fighters class B qualified as sector commanders. Commandants are selected through a civil service exam from captains with three years in the grade; lieutenant-colonels from commandants with five years in the grade. Direct entry captains are undergoing a 42-week course, and internal entry captains a 10-week course, at the National Fire College. Professional fire fighters class A+ hold senior management positions, such as brigade manager, deputy brigade manager, or senior expert for the government. Colonels are recruited through civil service exams open to fire fighters class A qualified as area managers. The laureates are undergoing a 32-week course at the National Fire College. Colonels hors-classe are selected from colonels with four years in the grade; contrôleurs généraux from colonels hors-classe with at least 8 years of experience as brigade manager, senior manager for the government, or similar positions that are listed by a decree. The contrôleur général insignia has 2 pyres. However, some officers who handle special responsibilities within the government can have a 3 pyres insignia. Paris and Marseille comprise 10% of the national total. Wikimedia Commons has media related to Firefighting in France. ^ a b c d Les statistiques des services d’incendie et de secours 2016 Retrieved 2017-02-16. ^ "French Fire-based VPS". Archived from the original on March 14, 2008. Retrieved 2008-09-18. ^ "Missions de l'ENSOP." Ecole Nationale Supérieure des Officiers de Sapeurs-Pompiers. Retrieved 2017-02-14. ^ "Décret n° 2017-164 du 9 février 2017 modifiant le décret n° 2012-520 du 20 avril 2012 portant statut particulier du cadre d'emplois des sapeurs et caporaux de sapeurs-pompiers professionnels". legifrance.gouv.fr. Retrieved 2018-09-23. ^ "Décret n° 2012-520 du 20 avril 2012 portant statut particulier du cadre d'emplois des sapeurs et caporaux de sapeurs-pompiers professionnels". legifrance.gouv.fr. Retrieved 2018-09-23. ^ a b "Décret n° 2012-521 du 20 avril 2012 portant statut particulier du cadre d'emplois des sous-officiers de sapeurs-pompiers professionnels, Chapitre II, Article 4." Legifrance. Retrieved 2017-02-14. ^ a b c d e "Arrêté du 8 avril 2015 modifié fixant les tenues, uniformes, équipements, insignes et attributs des sapeurs-pompiers" (PDF). interieur.gouv.fr. Retrieved 2018-09-23. ^ a b c d "Décret n°90-850 du 25 septembre 1990 portant dispositions communes à l'ensemble des sapeurs-pompiers professionnels". Retrieved 2018-09-23. ^ "Décret n° 2012-522 du 20 avril 2012 portant statut particulier du cadre d'emplois des lieutenants de sapeurs-pompiers professionnels." Legifrance. Retrieved 2017-02-14. ^ "Brochure réforme de la filière SP." Le SDIS de Maine-et-Loire. Retrieved 2017-02-14. ^ Formations d’intégration de lieutenants de 1° classe (FILT 1C). Retrieved 2017-03-29. ^ Formations d’intégration de lieutenants de 2° classe (FILT 2C) Retrieved 2017-03-29. ^ Formations d’adaptation de lieutenants de 1° classe (FALT 1C) Retrieved 2017-03-29. ^ a b "Décret n° 2016-2008 du 30 décembre 2016 portant statut particulier du cadre d'emplois des capitaines, commandants et lieutenants-colonels de sapeurs-pompiers professionne". legifrance. Retrieved 2018-09-23. ^ Formations d’intégration de capitaine de SPP (FIC) Retrieved 2017-03-28. ^ Formations d’adaptation de capitaine de SPP (FAC) Retrieved 2017-03-28. ^ a b "Décret n° 2016-2002 du 30 décembre 2016 portant statut particulier du cadre d'emplois de conception et de direction des sapeurs-pompiers professionnels". legifrance. Retrieved 2018-09-23. ^ "Arrêté du 4 janvier 2017 relatif à la formation des colonels de sapeurs-pompiers professionnels". legifrance. Retrieved 2018-09-23. ^ "Arrêté du 2 février 2017 pris en application de l'article 12 du décret n° 2016-2002 du 30 décembre 2016 portant statut particulier du cadre d'emplois de conception et de direction des sapeurs-pompiers professionnels". legifrance. Retrieved 2018-09-23.